‘My Pierre, I think of you without end, my head is bursting with it and my reason is troubled. I do not understand that I am to live henceforth without seeing you, without smiling at the sweet companion of my life.’ These are some of the heart-rending words Marie Curie wrote in a diary after the death of her husband, Pierre Curie, with whom she had won the Nobel Prize for Physics three years earlier. Pierre, born one and a half centuries ago today, also kept a diary, at least when he was a young man. Pierre Curie was born in Paris - 150 years ago today on 15 May 1859 - and educated at home by his father. Although he showed a strong aptitude for mathematics, lack of funds led him to take a laboratory job, in the Sorbonne faculty of sciences, rather than to full time study. As early as 1880, though, he and his older brother, Jacques, showed how an electric potential could be generated when crystals were compressed (piezoelectricity). By 1882, he had been put in charge of all practical work within the Sorbonne’s physics and industrial chemistry schools, but it wasn’t until 1895 that he obtained his doctorate - based on pioneering studies of magnetism - and was appointed Professor of Physics. That same year, Curie married Marie Sklodowska, a Polish student of his, and they would have two daughters, Irène and Ève. 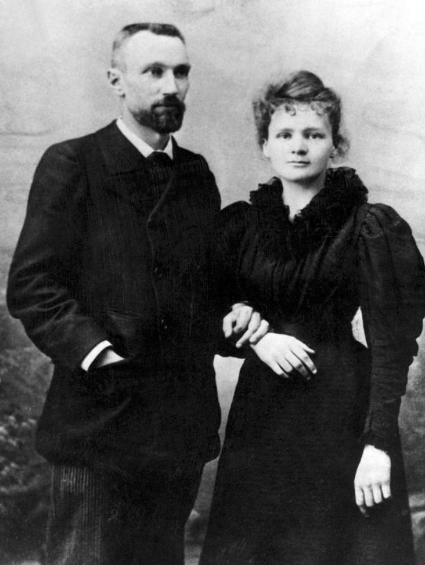 Collaborating, Pierre and Marie were the first to isolate radioactive substances - radium and polonium - by fractionation of pitchblende in 1898; and they were the first to coin the term ‘radioactive’. Their research formed the basis for many subsequent developments in nuclear physics and chemistry. Together, and jointly with French physicist Henri Becquerel, they were awarded the Nobel Prize for Physics in 1903. In April 1906, Pierre died after his skull was fractured when he fell under the wheel of a horse-drawn vehicle on a rainy night. Further information on Pierre and Marie can be found at Wikipedia, on the Nobel Prize website, and at the American Institute of Physics. The death of Pierre was a terrible tragedy for Marie. We know a lot about her feelings at the time because soon after her husband’s death she started writing a diary, the only one she ever kept. Years later, her daughter used some quotes from it for a much celebrated biography of her mother. The full text of Madame Curie - A Biography by Eve Curie, as translated by Vincent Sheean and published by Doubleday & Company in 1937, is available at Internet Archive. Some extracts of the diary (taken from Eve’s book) are also available on the website of the American Institute of Physics. And here are some extracts about Pierre. ‘We put you into the coffin Saturday morning, and I held your head up for this move. We kissed your cold face for the last time. Then a few periwinkles from the garden on the coffin and the little picture of me that you called “the good little student” and that you loved. It is the picture that must go with you into the grave, the picture of her who had the happiness of pleasing you enough so that you did not hesitate to offer to share your life with her, even when you had seen her only a few times. You often told me that this was the only occasion in your life when you acted without hesitation, with the absolute conviction that you were doing well. My Pierre, I think you were not wrong. We were made to live together, and our union had to be. Your coffin was closed and I could see you no more. I didn’t allow them to cover it with the horrible black cloth. I covered it with flowers and I sat beside it. . . There is some evidence of Pierre Curie having written a diary as a young man, but I can find (on the internet) only three extracts. The first two are from Eve Curie’s book, as above, and the last, brief one is from the Institut Curie website.